*There was no distortion, dislocation, obliteration of IV, compression of basal cisterns, obstructive HCP. *Skull fracture not depressed greater than thickness of cranium. There was no dural penetration, hematoma, frontal sinus involvement, cosmetic deformity, wound infection / contamination or pneumocephalus that warranted neurosurgery. [i] G\’omez, P., de-la-Cruz, J., Lora, D., Jim\’enez-Rold\’an, L., Rodr\’\iguez-Boto, G., & Sarabia, R. et al. (2014). Validation of a prognostic score for early mortality in severe head injury cases: Clinical article. Journal Of Neurosurgery, 1–9. Best match for Sn (0.67) and Sp (0.75) with cutoff >/=4(Sutter, Raoul Crit Care Med Dec 2013 Vol 41 No 12), original score cutoff >/=3. 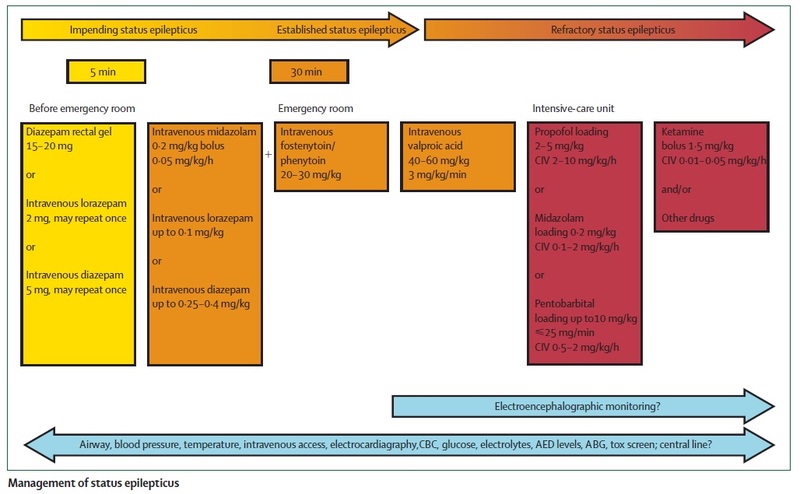 Impending or established status epilepticus: start with 20 mg/kg of fosphenytoin or phenytoin, and if status epilepticus persists, give an additional 10 mg/kg. UNLESS, focal status epilepticus without impairment of consciousness, IV treatment not indicated, load anticonvulsants orally or rectally. Refractory status epilepticus: IV valproic acid-start with 40 mg/kg and, if status epilepticus persists, give an additional 20 mg/kg. Continous intravenous infusion (CIV) usually starts with the lower dose, which is titrated to achieve seizure suppression and is increased as tolerated if tachyphylaxis develops. Ketamine: rule out increased intracranial pressure before administration. Other drugs: felbamate, topiramate, levetiracetam, lidocaine, inhalation anaesthetics, etc. Oral dose (mg daily) is approximately equal to [rate (mg/hour) x 3 + 3] x 10.